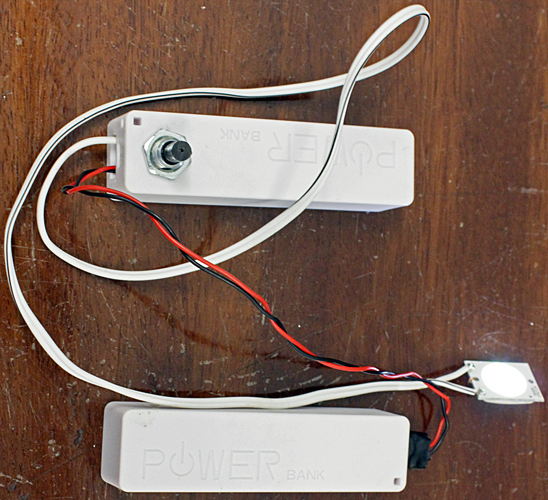 There is an extended version of this report in the password-protected Members’ area, with videos of the presentations and links to all of the photos submitted for a Barnard Award. 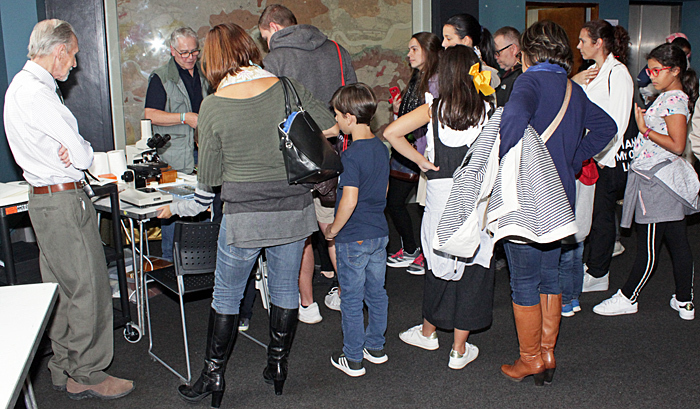 This was our fifth exhibition in the Flett Theatre and foyer and the PA135 Meeting Room in the Natural History Museum in London. 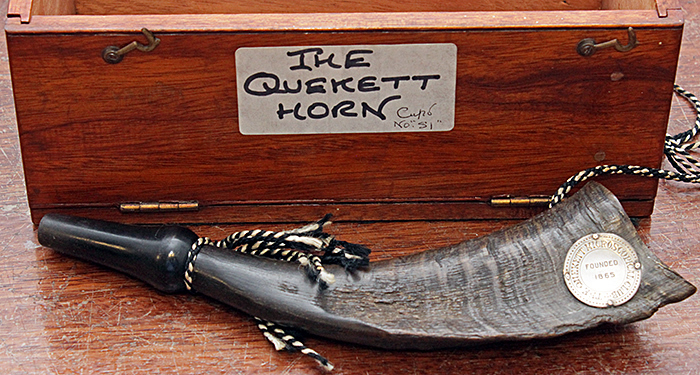 In accordance with tradition, the Club’s President Joan Bingley blew the Quekett horn to attract everyone’s attention and formally open the exhibition. 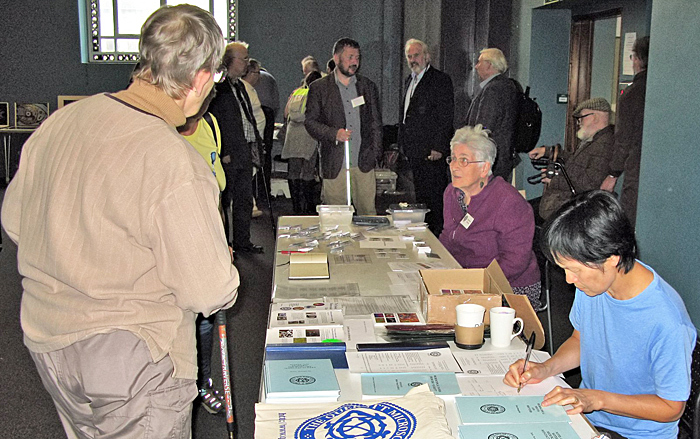 Deborah Bishop, Mary Morris and Thanya Nirantasook looked after reception, issuing name badges to members and invited guests, and sold several books, badges, USB drives and cloth bags from the Club Shop. 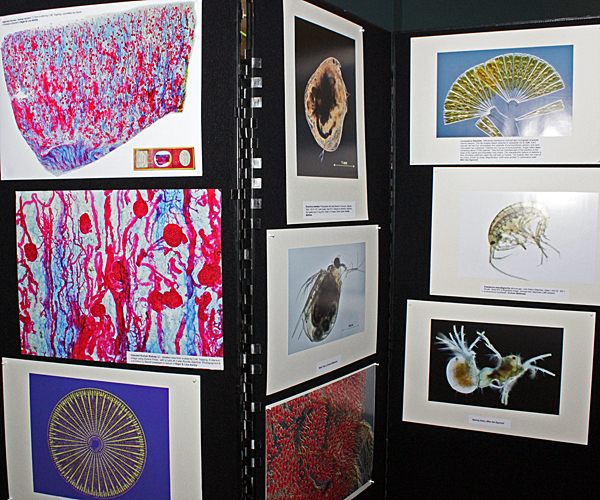 The main feature in the foyer of the Flett Theatre was the display of photomicrographs by Quekett members. 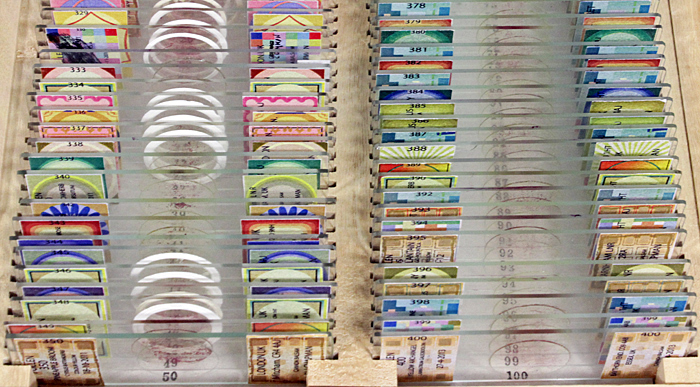 The photographs were displayed as prints and as a rolling display on a large wall-mounted monitor. 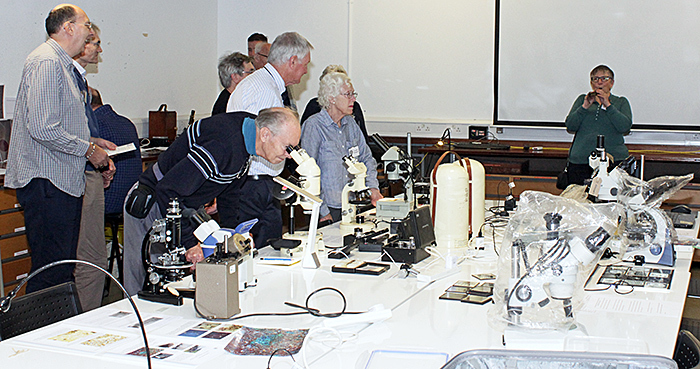 Dennis Fullwood brought his Nikon Labophot compound microscope and Olympus SZ4045 stereomicroscope to show some of the spectacular slides from his collection to visitors of all ages. 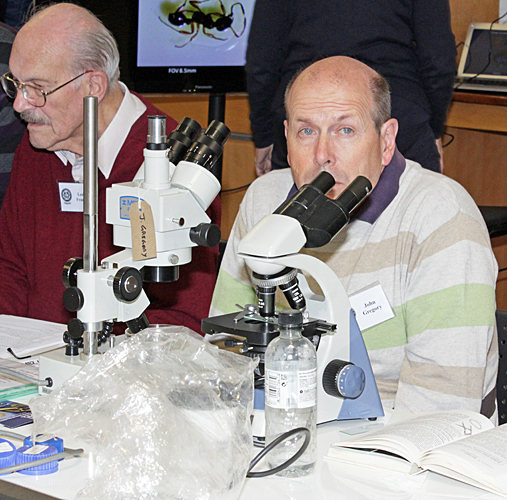 Dennis and Barry Wendon were also demonstrating how to make dry mounts that visitors could take away with them. Word somehow spread about this, and at times there was a queue of families waiting to see the slides and make dry mounts! 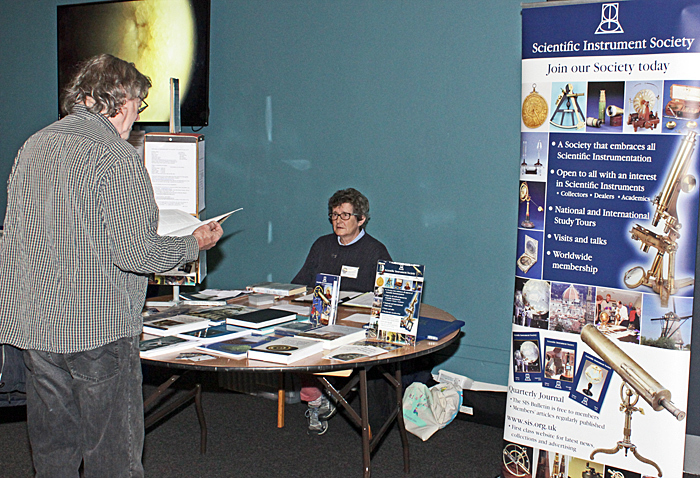 For several years, the Quekett has had a table next to the Scientific Instrument Society at the Antique Scientific Instrument Fair, and this year they had a table at our Exhibition to display their range of books and other publications. 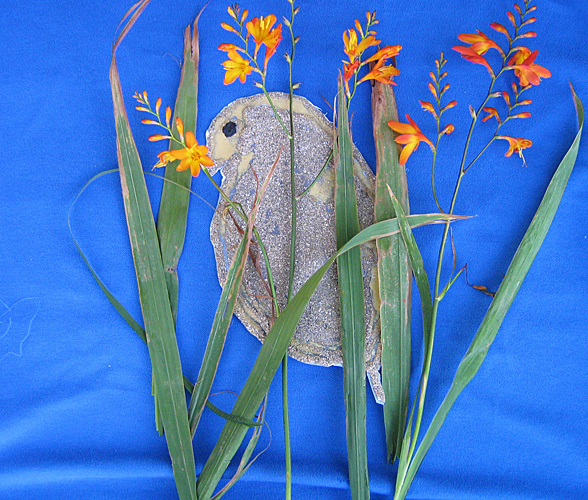 Artwork by Joan Bingley, Nathalie Chevallier-Hean, Alan Jones and Gwyneth Thurgood was also on display. 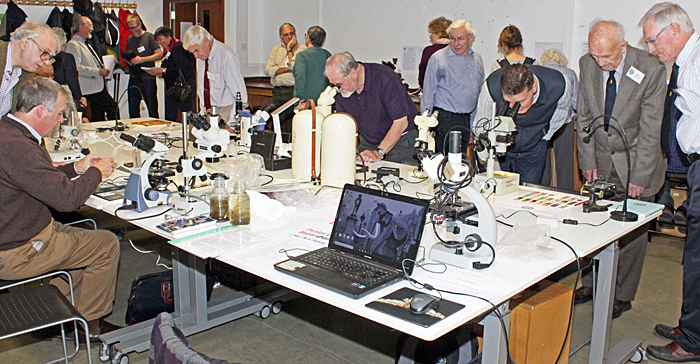 Downstairs in the PA135 Meeting Room, where only members and invited guests were allowed, there were lots of microscopy exhibits for us to examine and admire. 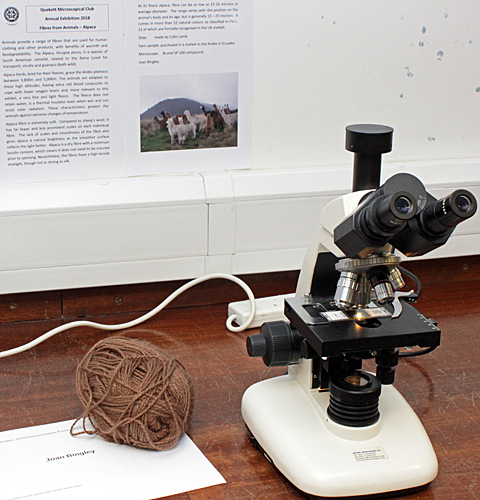 Joan Bingley brought a skein of brown alpaca wool that she had bought at a market in the Andes in Ecuador, and a slide of alpaca wool that Colin Lamb had prepared for her, together with notes and photographs. Alpaca wool is soft and has minimal lanolin content, the fibres are fine, and the scales on the fibres are far fewer and less prominent than on wool from sheep. It comes in 52 natural colours. 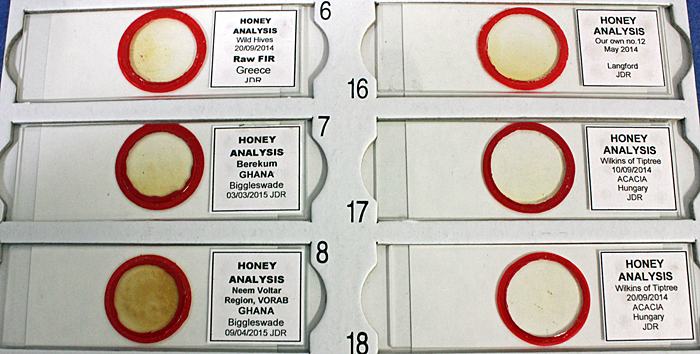 Kit Brownlee showed a micromount of realgar, a transparent sulfide of arsenic that has been used as a mountant for diatoms because of its very high refractive index (over 2.5). 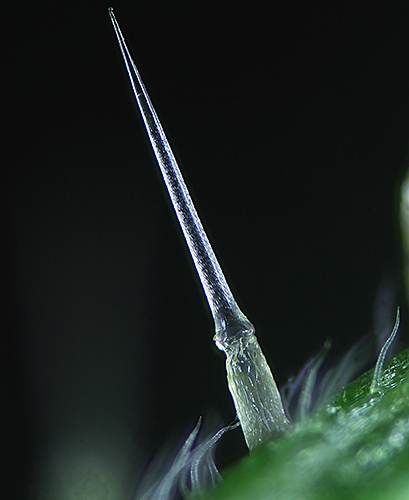 It is rarely used these days because it is very difficult to use as a mountant, and because of its toxicity. 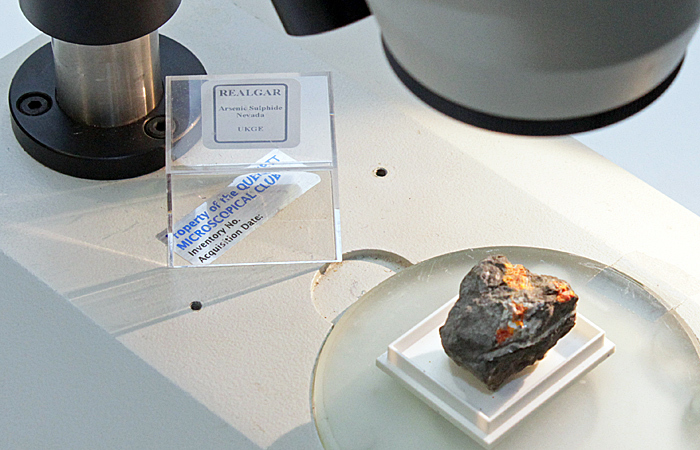 Realgar occurs naturally as crystals and as granules or powder, and it can also be synthesised. 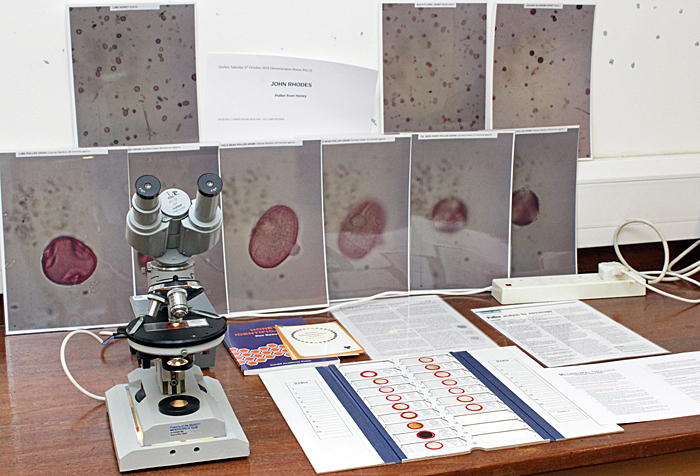 Norman Chapman brought a box full of his beautifully prepared and labelled slides of pollen, a folder of his drawings of pollen, and a copy of his book Pollen Microscopy. 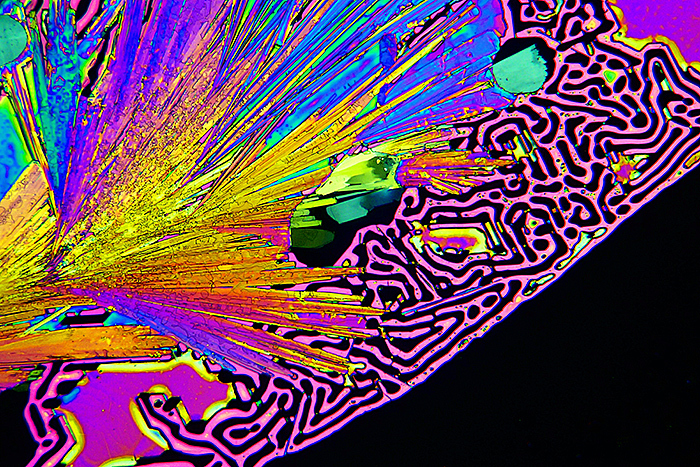 Brian Darnton made a welcome return after a gap of several years, showing lots of slides that he has made (including forams and leaf scales), his colour photo guides to forams, a compact LED illuminator made from 2 power banks from Poundland, and a power supply that allows both voltage and current to be varied and displayed on meters. 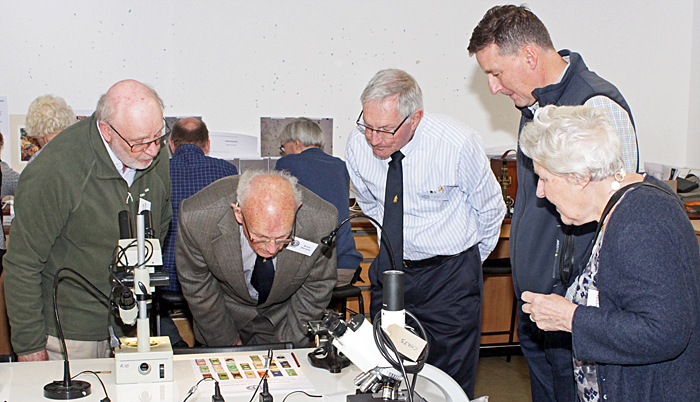 Brian also brought an old Crouch microscope equipped with polariser and analyser to show sand samples from Weymouth and other locations. 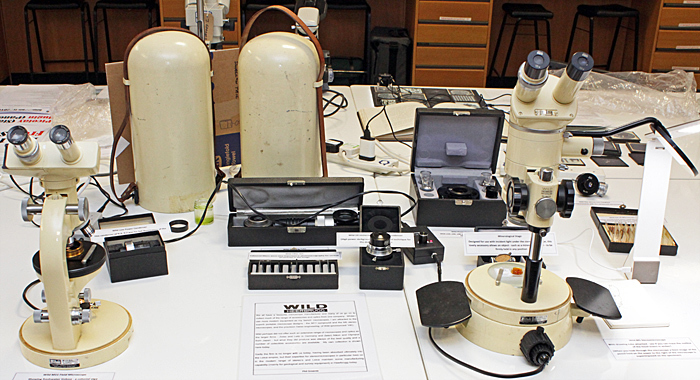 Phil Greaves showed 2 of his favourite Wild microscopes, an M5 stereomicroscope and an M11 compound microscope, both with their domed metal covers, and several accessories including drawing tubes, phase contrast condenser and objectives, low power condenser, dark-ground condenser, filar eyepiece, filters and a slide set. 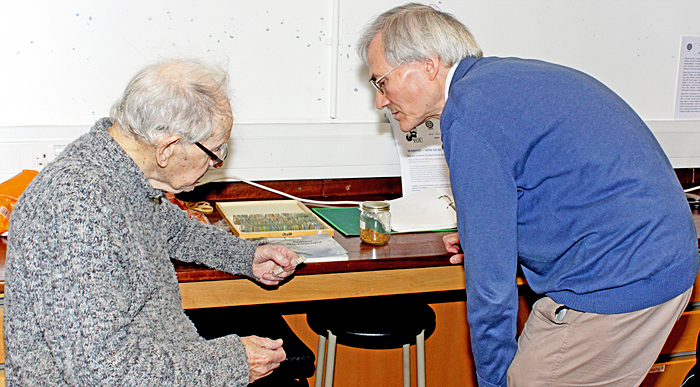 His specimens included large numbers of Volvox, collected a week earlier in Scotland. 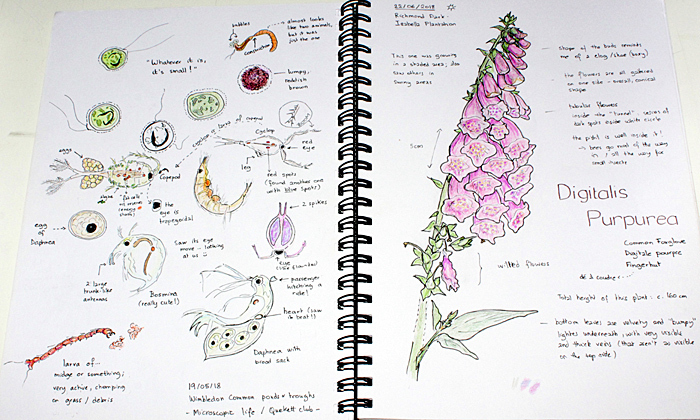 John Gregory brought samples of aquatic life from Strumpshaw Fen, an RSPB reserve on the River Yare in Norfolk that includes reed beds, woodlands and meadows, and borrowed a compound and a stereo microscope from the Club so that we could look for specimens. 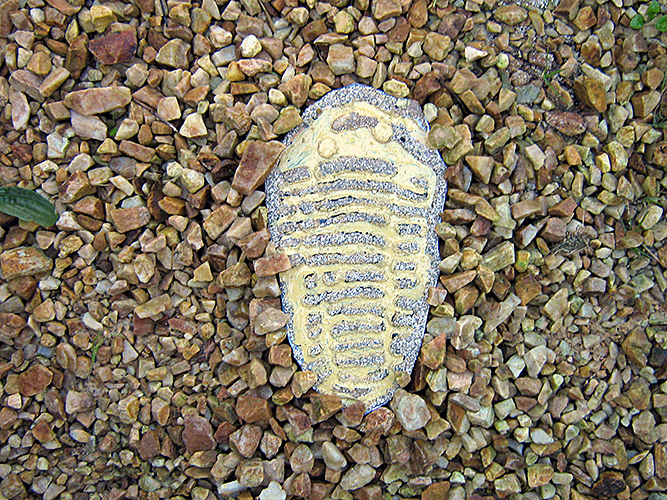 Pam Hamer’s topic was evidence for a meteorite strike in Clatcoll Bay in north-west Scotland, where an old red sandstone formation has odd green rock inclusions. The inclusions are believed to be fragments of Lewisian gneiss that were hurled into the air by a meteorite strike some 60 miles away near Lairg. 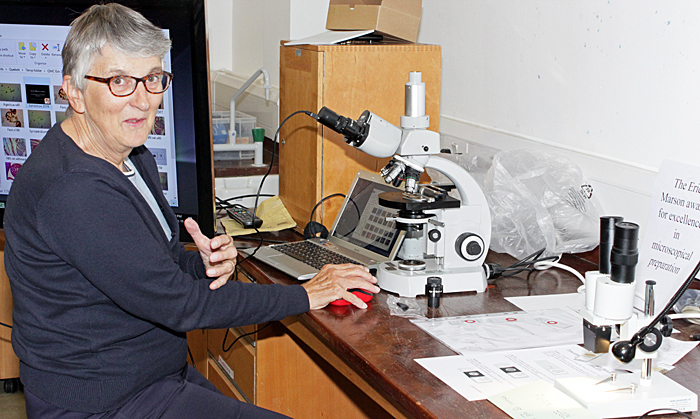 Pam brought a sample for viewing under a stereomicroscope, and scrapings of the red and green areas mounted on a slide for viewing with one of the Club’s Swift polarising microscopes. 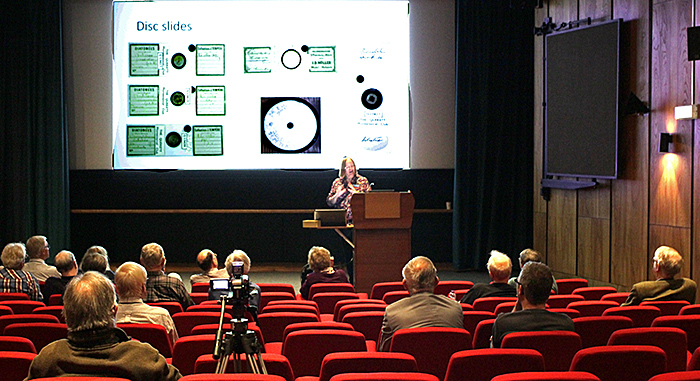 Jacky McPherson showed a selection of slides and documents related to her talk on the Quekett archives, including a set of slides from irrigation ditches in Khartoum (see R. Fraser Bastow, 1960, The Diatom-Flora of the Sudan, Journal Series 4, Volume V, pp. 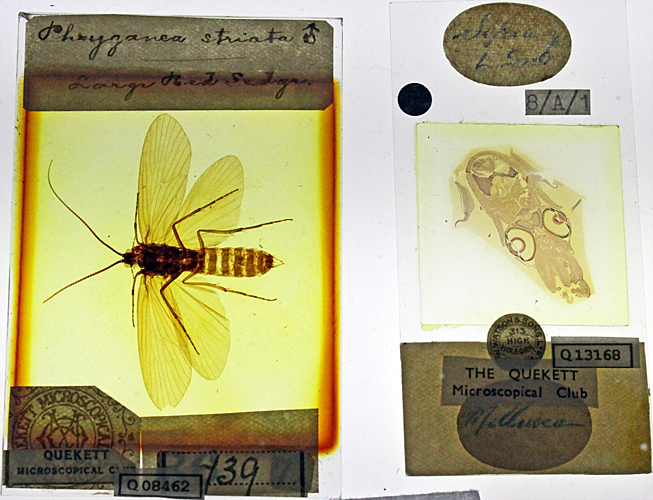 236–246), large slides of Phryganea striata (a caddis fly) and Sepia (a cuttlefish), slides from the Doug Richardson bequest, and a slide of selenite made by E. D. Evens that incorporated a wire so that the selenite could be observed while it was heated or cooled. 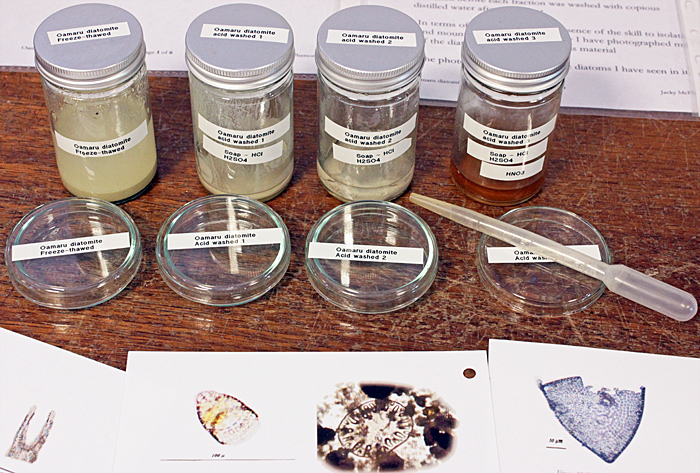 Jacky has been learning how to extract diatoms from the Oamaru deposit, and she showed some of the partly-processed material and some of her photomicrographs. 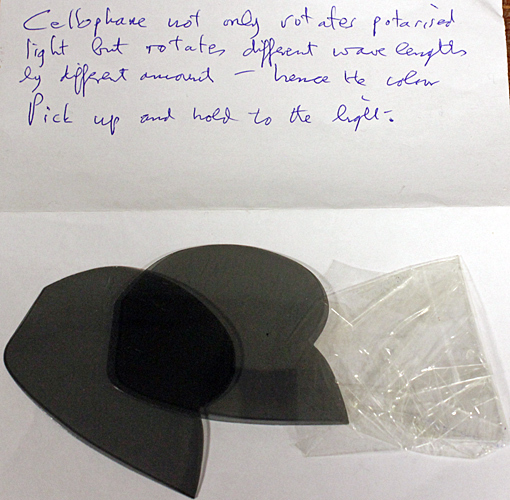 Maurice Moss continued his “Fun with Cellophane” series, demonstrating the colours that can be produced when Cellophane® (which is birefringent) is placed between 2 layers of polarising film and viewed by transmitted light. 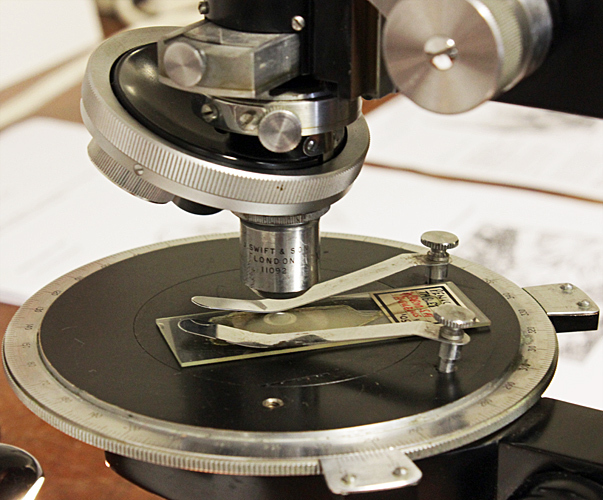 Stephen Parker purchased a small collection of lantern slides showing specimens under the microscope a few years ago, and brought them along and displayed them on an LED light box, with a loupe so that we could have a closer look. Stephen thinks they date from the first 2 decades of the twentieth century. 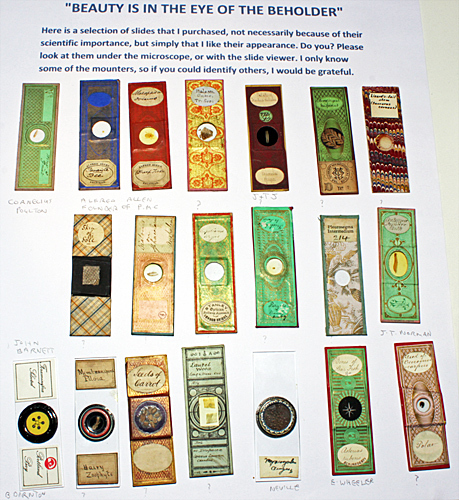 Some of them have Clarke & Page labels, and others may have been made by amateurs. 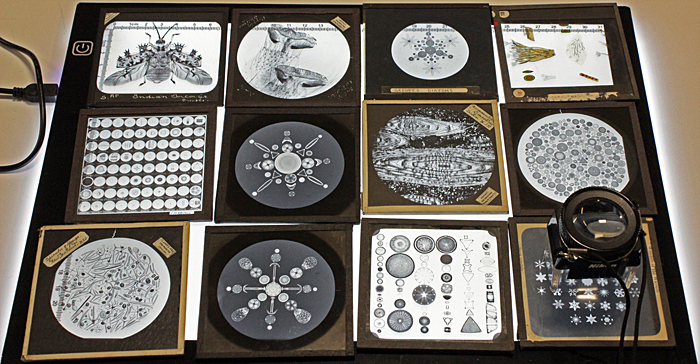 Stephen also brought a photocopy of a page from a Clarke & Page catalogue, and a copy of Photo-Micrography by Edmund J. Spitta that explains how to make lantern slides. 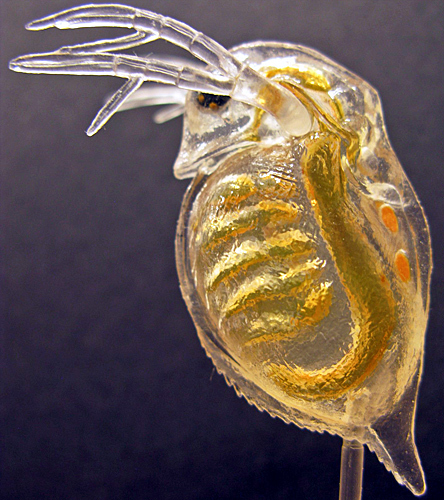 Robert Ratford brought several small microscopes and some Chinese plastic models bought on eBay, including a waterflea, a desmid, Spirogyra and a tardigrade. 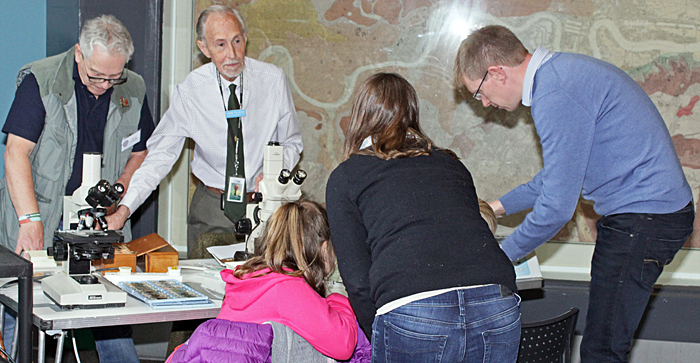 John Rhodes’ topic was melissopalynology, the study of pollen in honey, and he showed some of his slides (using one of the Club’s Lomo microscopes), some photomicrographs of pollen, and some relevant publications. 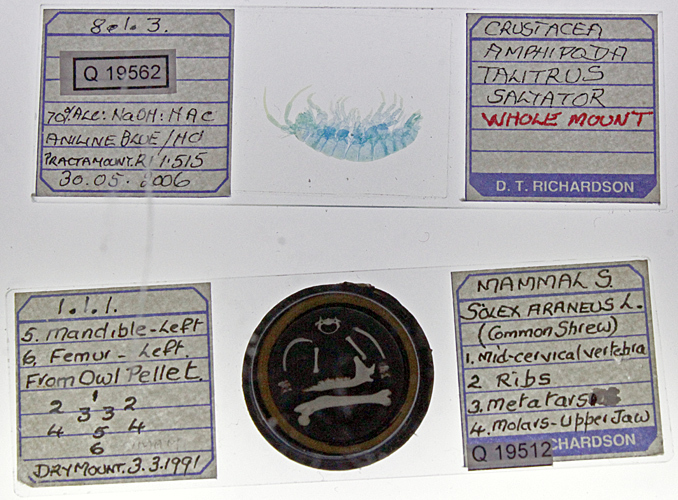 Mark Shephard brought an assortment of slides that had been labelled using a diamond stylus to write on the glass, instead of using paper labels. 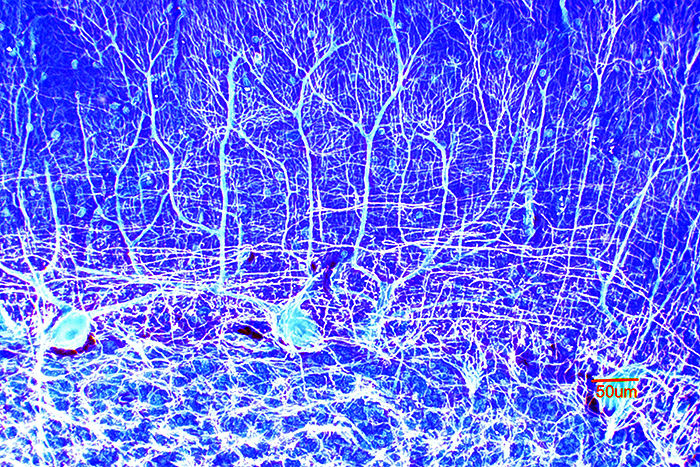 This technique seems to be mostly confined to early slides. The mounters included Andrew Pritchard and Smith & Beck. Chris Thomas was offering 1:1 demonstrations of some of the free software that he uses, Picolay for stacking (increasing depth of field) and Hugin for stitching (increasing field of view). 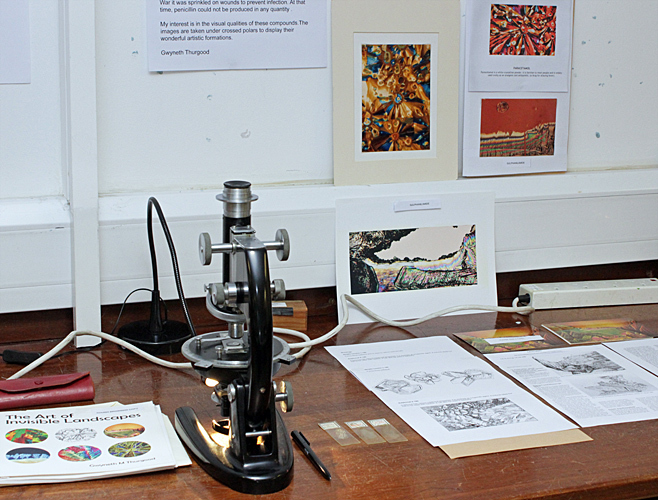 Gwyneth Thurgood showed some of her drawings based on crystals as seen under a polarising microscope, and provided one of the Club’s Swift polarising microscopes so that we could examine her slides. 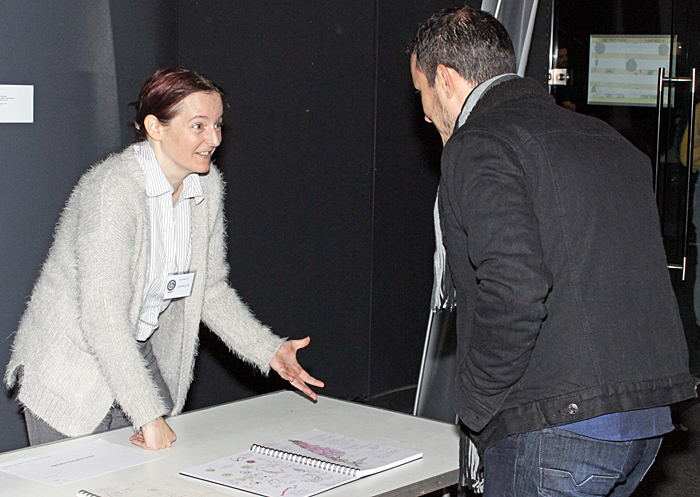 Gwyneth also had some of her drawings and paintings on display upstairs in the foyer of the Flett Theatre. 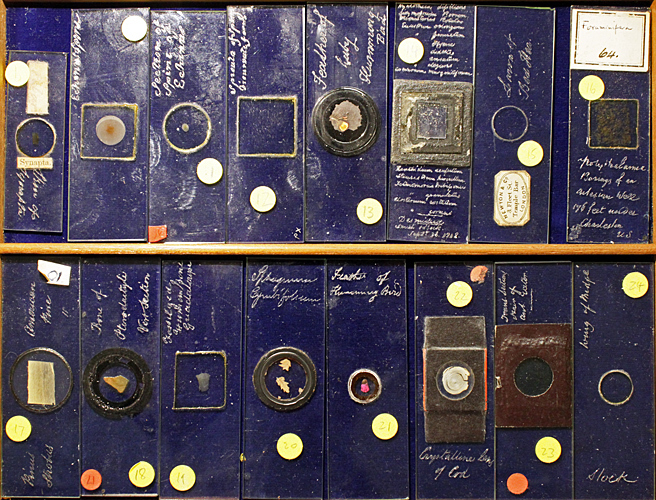 Nigel Williams brought some of his collection of old and attractive slides and asked for help in identifying the mounters. Members who were present were able to identify some of the mounters, and after Robert Ratford posted a photo on the QuekettMicro Facebook Group, Brian Stevenson identified another. 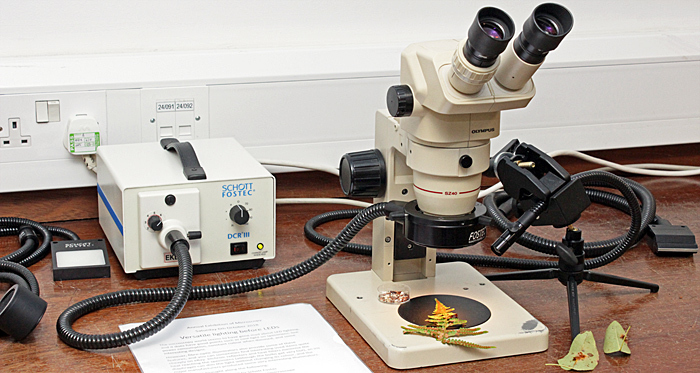 Alan Wood showed that LEDs are not the only light sources for microscopy, using a Schott Fostec DCR-III fibre-optic light source with a ring light, a gooseneck, a light line, a light panel and a dark-ground attachment. 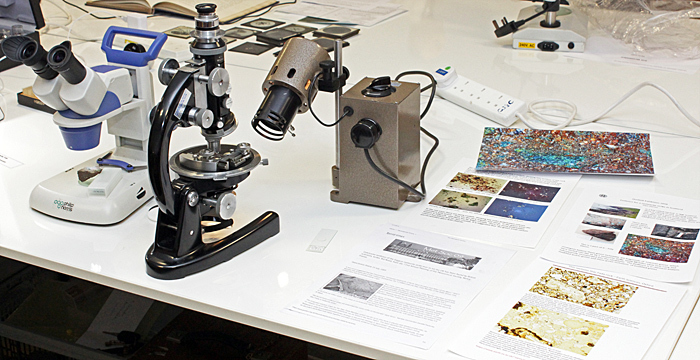 He used some of them with his Olympus SZ4045 stereomicroscope and specimens including sand from Sharm Obhur in Saudia Arabia (given away at Penkridge by Robert Ratford), stained slides, fern sori and pear leaves with a fungal gall, European pear rust, caused by Gymnosporangium sabinae Oerst. Charles Hussey recorded the two presentations, and they will be available in the password-protected area of the Quekett website. 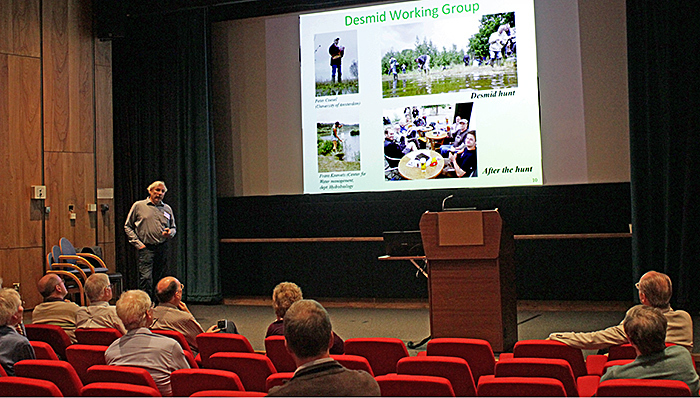 The first presentation was by Marien van Westen, who several years ago decided to survey the desmids of the Netherlands. 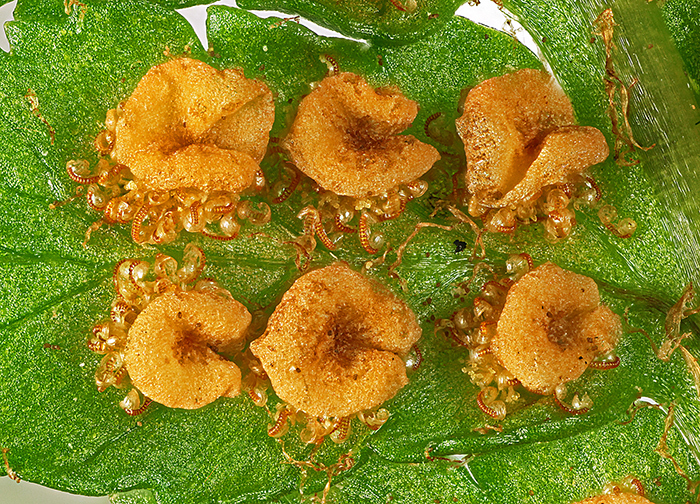 This turned out to be much more difficult than he had expected, and he found several species new to the country and some that were new to science. To help with the work, Marien wrote 2 computer programs, MICAM for taking photographs and a database for storing photographs and records. 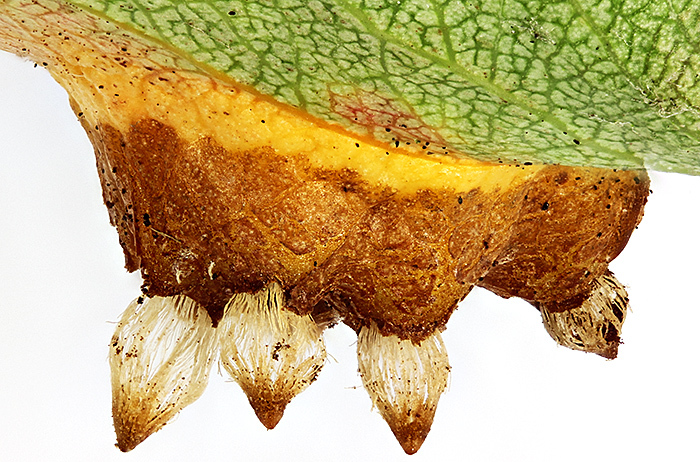 You can see many of his photographs and records in his website Desmids of Drenthe. The videos that members had submitted were then shown, followed by a longer video “Becoming” by Jan van IJken on the embryological development of the alpine newt. After lunch, Jacky McPherson gave the second presentation “A taste of the hidden gems of the Quekett Archive”. 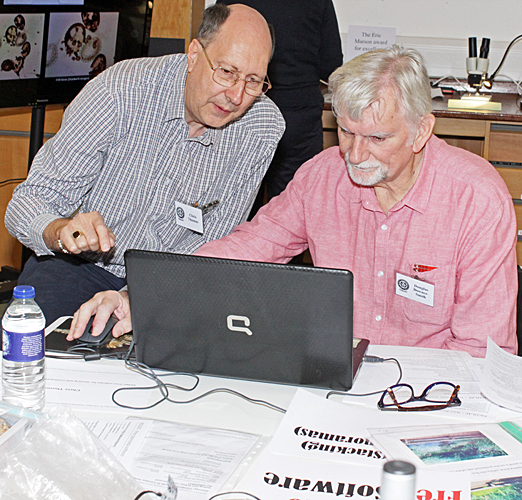 Jacky is one of the team that has been delving into the Club’s archive, trying to identify and catalogue everything with the aim of making as much as possible accessible via the website. She showed us some of the fascinating slides and artefacts and told us some of their history. 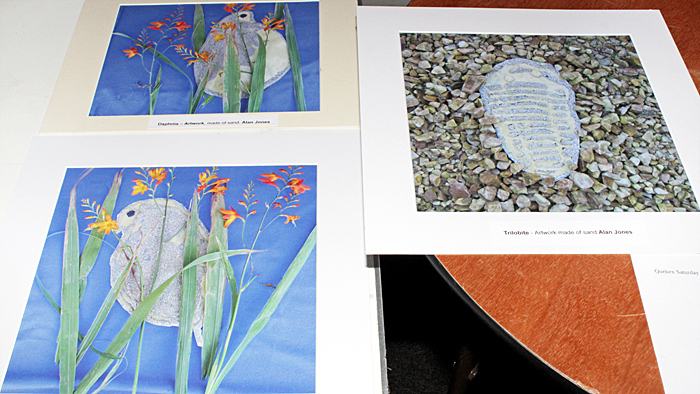 Jacky showed several of the real items in her exhibit in the PA135 Meeting Room. 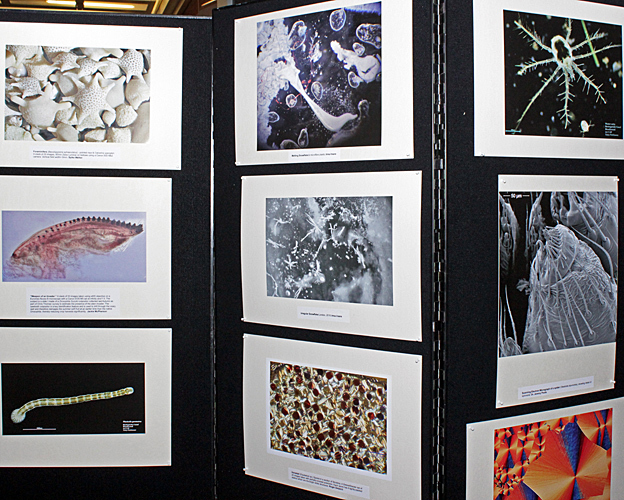 Pam Hamer judged the slides that Quekett and PMS members had submitted, and this year she also took photographs and photomicrographs of them and produced a Powerpoint presentation that was shown on the television. 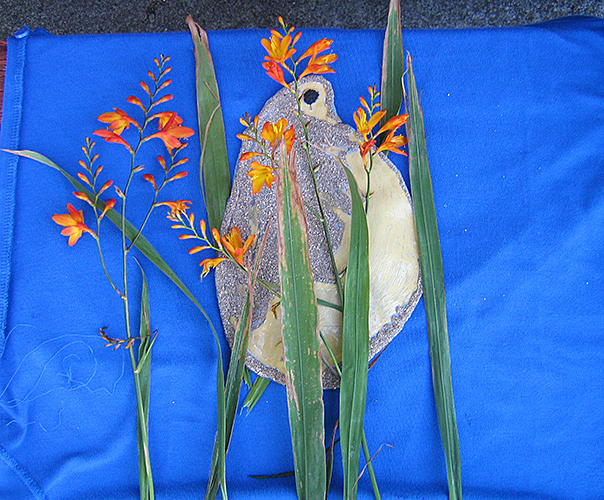 Click the arrows to see the next and previous slides; click the symbol at bottom right for a larger version. All of the slides and their accompanying notes were on display. 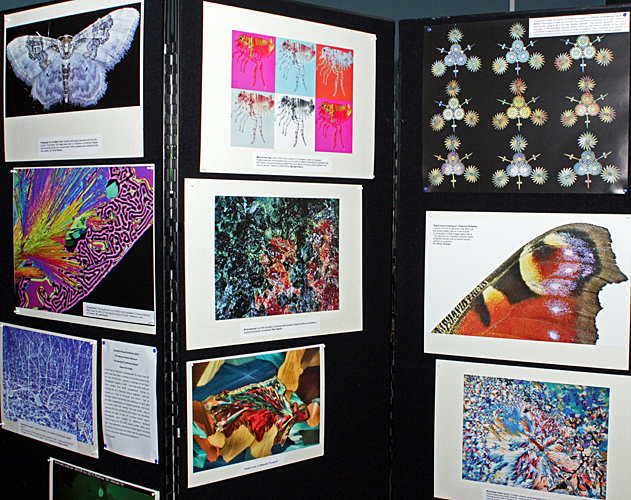 Mike Gibson organised the photograph display again this year, and arranged for the best ones to be printed and mounted so that they could be displayed in the foyer of the Flett Theatre. 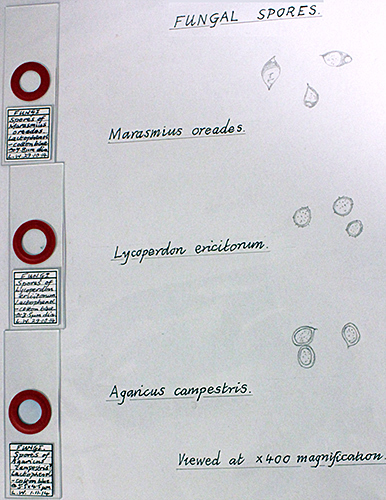 Mike also prepared a rolling Powerpoint presentation of all of the submissions, and this was shown on a large wall-mounted monitor. 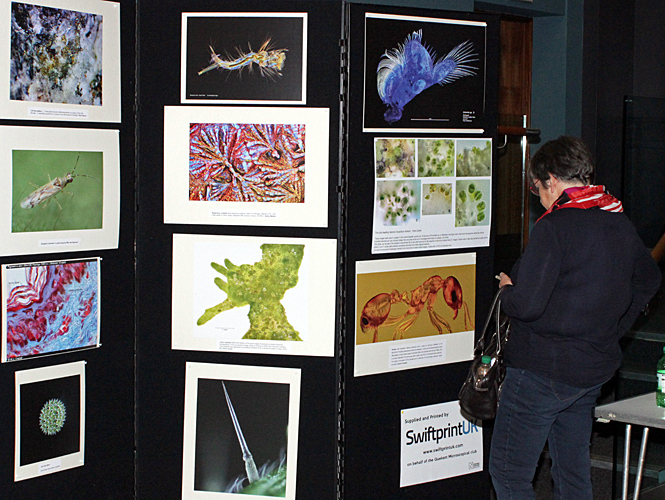 The judge this year was Alan Edwards LRPS, who has had an interest in photography for more than 40 years. 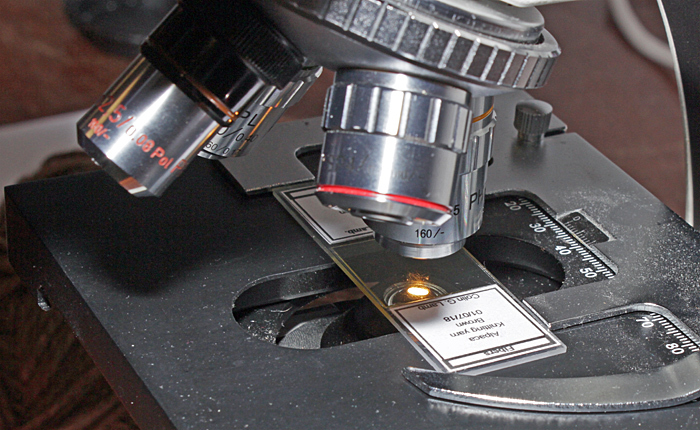 At work as a chemical process engineer, he used to use an Olympus metallurgical microscope at 100× and 500× with an SLR camera to evaluate the size and density of tri-cation zinc phosphate coatings on steel as part of a process control regime. Alan judged the photos before the event, but the ones chosen to receive a Barnard Award were not announced until the certificates were presented. 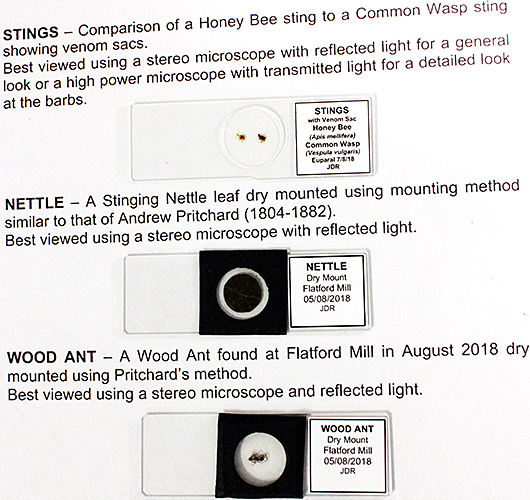 Certificates were awarded to Alan Wood (stinging hair on nettle stem), Chris Algar (mosquito larva), David Linstead (injected human kidney), Graham Mathews (Madonna lily flower bud (mature anthers)), Irma Isara (melting snowflake and micro fibre plastic), Jeremy Poole (Steatoda bipunctata spinneret), Les Franchi (crystal maze), Mike Gibson (cholesterol acetate crystals), Roger Delpech (cerebellum woods), Spike Walker (ketamine crystals, star sand), Tony Pattinson (Artemia phyllopod) and Wim van Egmond (marine diatom colony). Certificates were awarded to Sinclair Stammers, Willem Cramer, Wim van Egmond and David Bryson (blood drying). John Tolliday judged the entries for the second year of this category, and decided to award certificates to Alan Jones, Gwyneth Thurgood, Joan Bingley and Nathalie Chevallier-Hean. the NHM security staff for their help.